John Adamson returned to Australia on the 12th May 1919. Discharged on the 7thJune 1919. In 1915 John was the Hon Secretary for the Beaconsfield Sports Club. On the 30th April 1923 John married Elaine Pell from Colac, Victoria. After the war he continued his occupation as carpenter. John and his family were well known residents of Beaconsfield. Died on the 6thNovember 1978. Cremated on the 9thNovember 1978 at Springvale Botanical Cemetery. Roll 1 Australian Stationary Hospital 14-16 Reinforcements. 2 Australian Stationary Hospital 14-16 Reinforcements. Dermatological Hospital 3 and 4 Reinforcements. 1 Australian Casualty Clearing Station 3-5 Reinforcements. 2 Casualty Clearing Station and 1-5 Reinforcements. 3 Australian Casualty Clearing Station 1 Reinforcements. 1 Sanitary Section 1-5 Reinforcements. 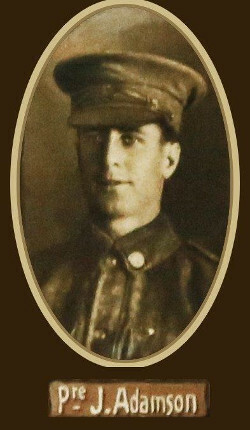 (November 1915-May 1916).